Artemisia test plot at UK's Spindletop Farm in Lexington. Photo by Matt Barton, UK Ag Communications. LEXINGTON, Ky. (Sept. 18, 2018) — A University of Kentucky College of Agriculture, Food and Environment research trial studying the feasibility of growing plants used to treat malaria was successful in its first growing season. 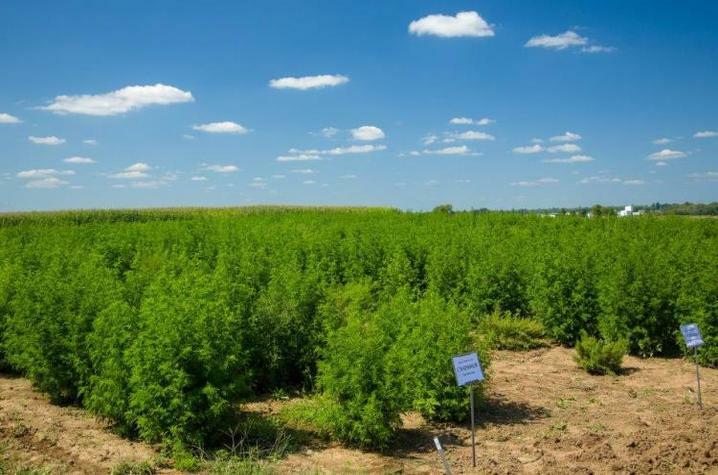 In March, the college’s Kentucky Tobacco Research and Development Center personnel signed a memorandum of understanding with officials from ArtemiFlow, a German-based company, to grow artemisia plants. UK researchers grew three varieties on a little more than an acre at UK’s Spindletop Farm in Lexington. The crop's success can be attributed to the abundance of rainfall this season, as it negated the need for any irrigation. “We expect to collect 1,000 to 1,750 pounds of dry weight biomass per acre, maybe higher, we don’t know,” said Patrick Perry, KTRDC field research coordinator. The artemisia will be harvested around flowering time when the artemisinin compound in the plant is the highest. The researchers will then analyze the crop for its chemical compounds. “We can’t say definitively how these plants are doing right now, until we get the data back at the end of the year after our chemical analysis,” Perry said. ArtemiFlow officials visited Lexington recently to see the crop for the first time and were excited about what they saw. Seeberger, and business partner Kerry Gilmore started ArtemiFlow. Seeberger and Gilmore, who are scientists, have developed an inexpensive and efficient process to take the compound from the artemisia plant and create a pharmaceutical. ArtemiFlow is able to do this process on a large scale to Food and Drug Administration standards. Malaria is a disease that affects up to 200 million people a year. It is an easily treated disease with the medicine made from the artemisia plant, but people die every year because they don’t have access to the medication. There is a huge black market for the medicine in Africa and Southeast Asia. “There are only two ways to fix the problem. Inject more money into the system and buy more medicine that is out there, or we can produce these medications more cheaply and efficiently. That is what we want to do,” Gilmore said. ArtemiFlow’s goal is to make Kentucky the world’s leading producer of artemisinin-derived medicines by combining the efficiency and cost savings of the chemical manufacturing technology with highly skilled and innovative farmers in the area.